To really reduce fares, we need to make rail into an all-day transport service. South London is a key opportunity for transformation. It’s become an annual tradition: when the inflation index is published for July, the campaigners start putting out press releases about what that means for rail fares in January. Eventually the government agrees to reduce it by a little. This makes the campaigners seem important, and the government seem generous, so everyone’s a winner. But it detracts from the underlying issues. To get fares down properly, we need lots more people using the railway off-peak. The cost of running the service is mostly fixed, so the more people travel when there’s spare capacity, the lower the cost per journey. In due course, this will feed through to lower fares. Longer-distance services into London roughly pay for themselves. This is where rail is strongest – running fast into the centre of London. It’s also where improvements to rail have the greatest effect, because getting to and from the station has (proportionately) least effect. Inevitably, railway management tends to focus on these services, rather ignoring the shorter-distance ones. This is a problem, because it is the short-distance services that require the subsidy. But it’s also an opportunity, because short-distance services are more likely to work for leisure journeys. All you need is a high-frequency service, easy access to and from the station, and something worth going to. Putting this together, there’s a distinct virtue in short-distance services being managed separately from long-distance services, and integrated with connecting services in the centre. If you can combine that with improving the attractiveness of the city centre, all the better. For a number of reasons, the short-distance services in south London have remained part of the national rail network, rather than being incorporated into the Underground. The network is more interconnected, so it couldn’t readily be linked into the Underground one line at a time, as was done in north London. Instead, the whole inner network needs to transferred in one go, with just a few fast lines left for the outer services. New flyovers north and south of East Croydon. These allow fast services to run from Victoria and London Bridge through East Croydon without conflict, but with cross-platform interchange. This increases the capacity for outer services, allowing the inner services to terminate. 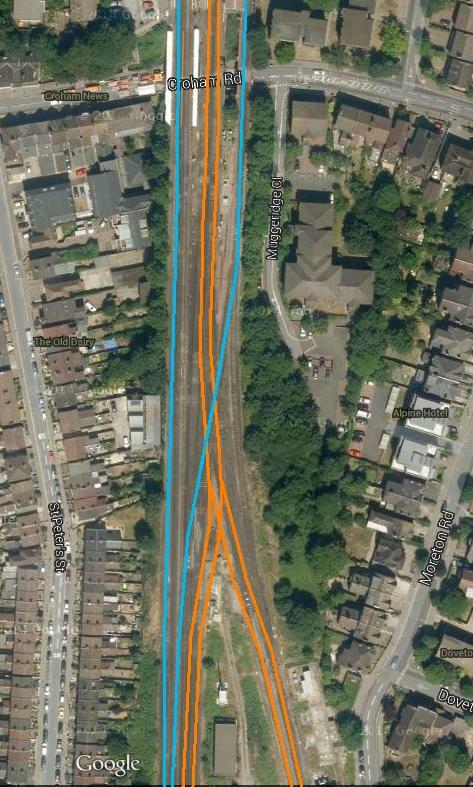 The first flyover is at Windmill Bridge (just north of East Croydon), and will take the southbound Victoria fast line (blue) over the London Bridge fast lines (orange). This reduces the inner services to a single line for a short way, but this is sufficient. 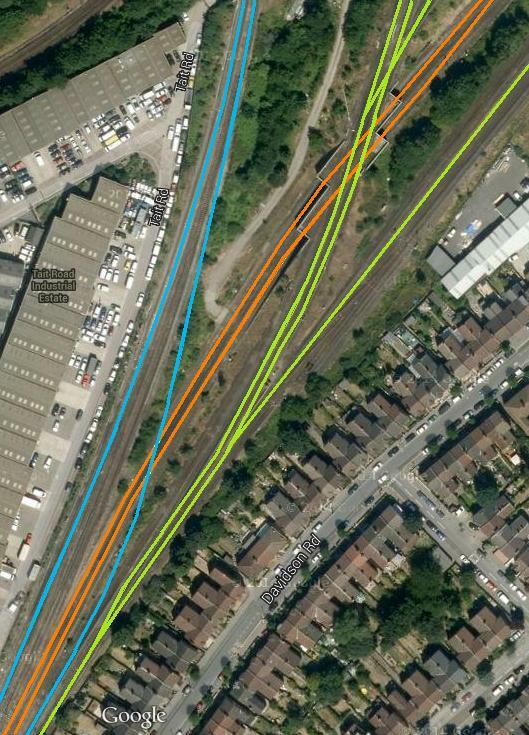 The second flyover is at South Croydon, and will take the southbound Victoria fast line (blue) back over the London Bridge fast lines (orange). 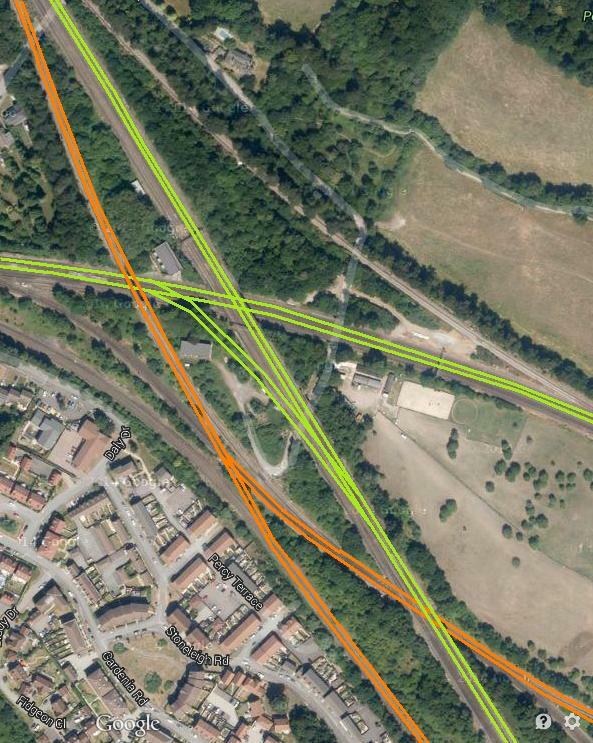 A new bridge, and a rearrangement of lines at Chislehurst. This diverts the Kent mainline outer services (orange) away from the stopping services (green), so that they can take over the lines to Chatham and Maidstone. A new curve between the fast and slow lines allows the stopping services from Bromley South to run to Orpington without conflicting with the fast services. Six-tracking of the section from St Johns to New Cross. 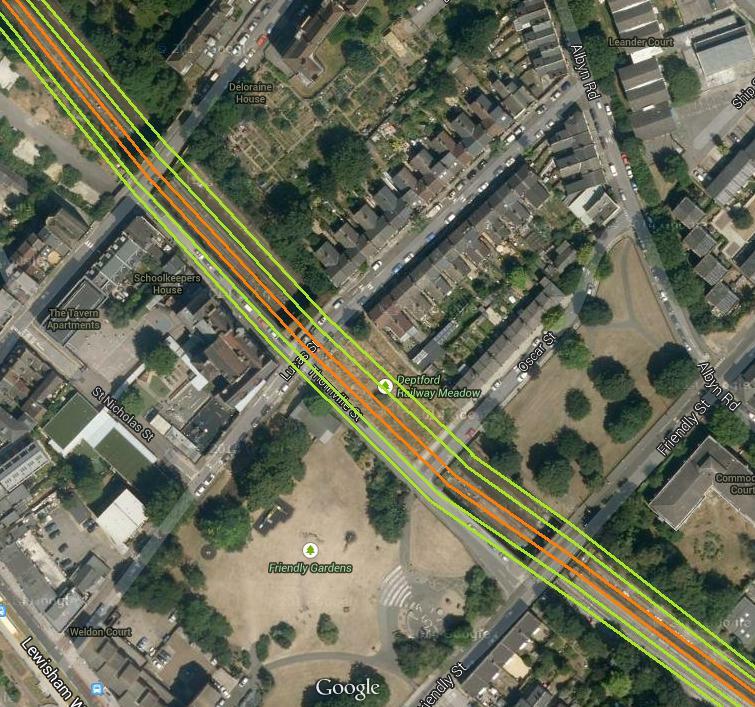 This keeps the outer services (orange) separate from the Charing Cross and Cannon Street locals (green). The outer services can then run into Thameslink using the new flyover at Bermondsey. This requires the widening of the cutting under a local street, and rebuilding a number of bridges. There are a couple of tight spots, but it looks feasible. With a few fairly simple changes, all the local lines out of Victoria, Charing Cross, Blackfriars, Cannon Street and London Bridge can be separated from the outer services, and integrated with the Underground. Off-peak service frequencies can be increased, making rail into a true all-day transport service. If this is combined with making central London into an attractive leisure destination, then more people will travel off-peak, spreading the costs, and (ultimately) reducing fares. Original imagery courtesy of Google Maps.